Cities: Skylines seems like natural progression for developers at Colossal Order. Their previous two games focused on managing all aspects of public transportation system; Cities in Motion provided a good nostalgic trip to the days of Traffic Giant, and while the sequel wasn't as strong, it allowed users to interact more with the city itself. Cities: Skylines, then, can be considered the next logical step – a full city management simulation game, where players are tasked with building and running a happy metropolis. The title may be lacking in some areas, but on the whole it's a solid entry in a genre that has been stagnating for years. Colossal Order chose to stick to basics. 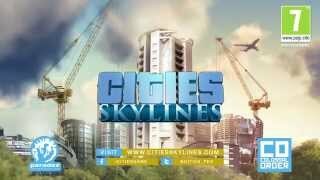 Skylines isn't a game that features much structured content or a campaign of any kind, nor is there multiplayer. There aren't even any pre-built cities included. Instead, players choose a land area to start, and off you go. A highway that stretches to the edges of the landmass provides your lifeline, as you begin to lay down roads in hopes of creating something that looks more exciting than a square grid. There are various road types, and they can be deployed as straight stretches, roundabouts, elevated ramps, and everything in between. Given that players can only build and zone next to roads, the tools provided for building them are thankfully very flexible and easy to use. After a small set of roads are deployed, players select the zoning tool and assign areas next to the road for a particular use. 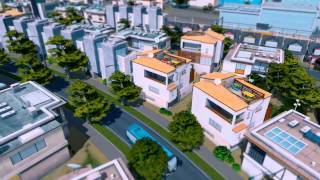 To start off with, you can only access low density commercial, industrial, and residential. That's because the game uses a milestone system, where players are limited on items and zones they can build until your city's population reaches a certain point. So for example, you can't build schools, health clinics, or even a landfill until you've got 500 citizens. Once you reach 1000, you get access to fire department and police stations, and so forth. It's the primary mechanism the game has from keeping players expanding too quickly and draining their budget. It’s the closest the game gets to any sense of structured progression, and while the design is sound, it can feel rather restrictive. You have to either purposefully leave some space in your zones for future buildings, or demolish some poor family's house or a grocery store to place the new fire station. To its credit, the game does offer a mod to turn off milestone restrictions and provide unlimited cash, so you can build to your heart's content. Once you've designated a zone for areas around a road, citizens will move in and buildings will be automatically created. The zoning tool allows for some very precise adjustments, as the size of the zone will affect the sort of building style that will appear there. Immediately after moving, citizens will demand water, waste, and electricity services, so you best have been working on a plan to run a pipeline to the nearest river, and placed a water tower nearby. Electricity can be produced via green methods such as wind turbines (which are most efficient in limited windy locations) or standard generators. The concerns are usually noise and pollution, so hopefully you've planned the placement ahead of time. Power lines will need to be run, but at least you only need to reach an edge of a populated zone, and then all adjacent buildings will get the utility service. As your small town grows, you'll unlock new services, road designs, as well as new policies. These laws let players control various aspects of the city, such as issue bans on smoking or pets, enforce limits on water and power usage, or mandate recycling. You'll be able to give tax breaks to specific zones, or ban certain buildings from appearing in order to maintain a certain aesthetic. Natural resources are also worth mentioning – you can create industrial zones and apply certain specializations to them, such as forestry, ore and oil extraction, and farming. These industries add to the pollution, but produce more income. Finally, decorations such as parks, trees, and unique buildings help boost happiness of citizens, and attract more tourists to the city. All of these options offer greater depth to the experience in Skylines, and ensures that no game will ever play out the same. That's a good thing, too, because for the most part there is not much challenge. Given the milestones, users won't be able to balloon their budgets so money is rarely an issue. Your citizens' happiness is also easily satisfied, and there are no natural disasters or events that can cause devastation as they do in SimCity. So on the whole, Skylines is a rather peaceful sandbox that doesn't present much of a gameplay challenge once you're familiar with the mechanics. The only reason to keep restarting anew would be to see how great of a metropolis you can build. A hard mode mod is included, though. The most headaches will likely be caused by the traffic gridlock, an appropriate outcome from developers that created transportation-focused games in the past. Because of milestone progression gating, it's likely that the main road artery ways into the city will need rebuilding once you've unlock more road types, to handle the bigger car loads. There's also public transportation to build out, such as busses and metro. It's enticing to see your city infrastructure evolve as it supports more and more citizens, but be prepared for demolition and re-organizing, as removing roads also removes all buildings alongside them. But you likely won't be demolishing to make space, because the game offers a huge amount of land to work on. All cities start in a single 2km x 2km square, but as you grow, adjacent lots of land become available for sale, and you can end up with 9 map squares in size. That's 36 sq km, and nothing to sneeze at compared to the tiny SimCity 2013 lots. So while Skylines offers an impressively polished set of building tools, and the core gameplay is very well designed at the basic level, there are shortcomings. Players will likely notice that while the game's aesthetics are pleasing, they are fairly basic, and this is unlikely to be the best looking strategy game you've played this year. The textures are basic, and building variety is rather limited, as are the effects. There is no day/night cycle and no weather effects. Audio design is minimal as well, with somewhat annoying howling of the wind dominating the soundscape when you zoom out too far, and the repetitive screaming of the sirens down at street level. As mentioned earlier, this is truly a game that wants players to plan far in advance, otherwise you'll end up having to rebuild quite a bit of infrastructure. With milestones gating off later buildings, you will have no choice but to bulldoze things, even if you do plan in advance on how to build out. Your services such as fire and police cover a frustratingly small area, thus needing for very frequent placement. And of these service buildings there are very few varieties (two sizes of police and fire stations, etc). Fires seem to be out of control as well, occurring with jarring frequency. Maintenance and purchase costs for some buildings probably needs better balancing. Sometimes, traffic refuses to use more than one lane in a multi-lane highway and creates artificial traffic jams. Other annoyances include not being able to deselect the building tools with right click, and a lack of proper tutorials (though there are tooltips) . But while Cities: Skylines may lack the extensive variety of assets and polish that an EA game may provide, it hopes to make it up by a notably lower selling price point, and more importantly modding support. Steam Workshop is directly integrated into the game's main menus, letting you download the latest and greatest creations from other fans. And those creations are pretty darn good, because the terrain and asset editor that comes with the game is just as robust as the in-game city building tools. It's likely that within a few short weeks, many of the grievances in the title will be fixed by the community, and tons of maps and assets could be added to significantly expand your building experiences. The new title from Colossal Order may not be a revolution for the city building genre, but it's a well-designed sandbox experience that's priced right. There are no gameplay bugs to speak of, and whatever shortcomings the game has will likely be addressed by the community. If you've been longing for a municipal management sim with a very solid foundation and a bright future, Cities: Skylines is likely to satisfy. The game looks and sounds OK, though more variety and crisper visuals would have been welcome. A very solid foundation for a city builder, the game offers all the tools players should need to make the experience even better with time. No campaign, just a free build mode. Milestones are a decent way to gate progression and smooth out the learning curve. Well optimized and runs without issue, partly thanks to not overly demanding visuals. 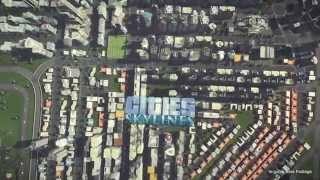 Cities: Skylines provides solid city management for the right price. And with strong mod support, its few shortcomings in gameplay and content variety will likely be resolved by the community itself.